The organization made a post on its official blog to highlight the release of a new Greenpeace International analysis, which found that Apple "lacks a plan that outlines a realistic path to eliminate its reliance on coal." 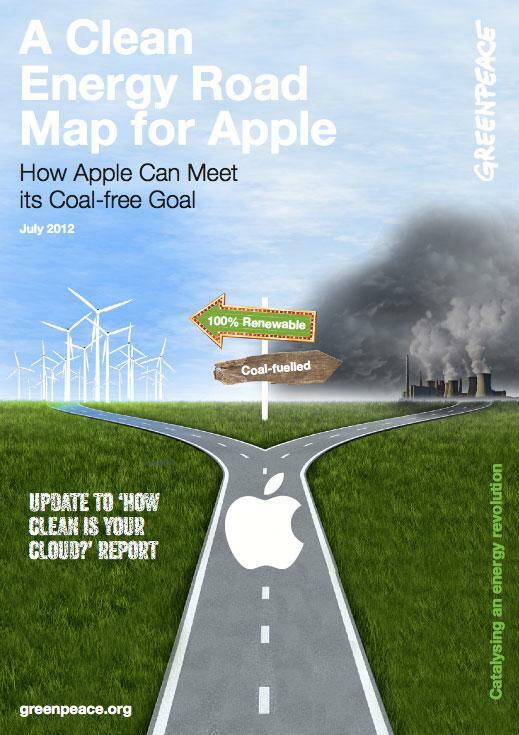 The report is entitled, "A Clean Energy Road Map for Apple." Greenpeace opted to re-score Apple because of what the group called "ambitious and public commitments to clean energy." In the "Road Map," Greenpeace now gives Apple a score of 22.6 percent on its "Clean Energy Index," up from April's score of 15.3 percent. Apple's grades went from 'F' to 'D' in "Infrastructure Sitting," and 'D' to 'C' in "Energy Efficiency & GHG Mitigation," as well as "Renewables & Advocacy." Apple's grade of 'D' remained unchanged in "Energy Transparency." Choose a renewable-powered local utility for its Oregon data centre, not buy renewable energy credits from coal-powered Pacific Power. Secure a sustainable source of biogas to directly power its fuel cells for North Carolina. Invest directly in new renewable energy generation in North Carolina rather than buying renewable credits to "green" Duke Energy;s dirty electricity. Demand Duke Energy eliminate its mountaintop coal removal operations from Apples electricity supply chain, and demand that Duke invest in new renewable energy generation capacity, not retrofitting and extending the lifetime of dirty coal plants. Greenpeace's reassessment of Apple was prompted by the company's announcement in May that its iCloud data center in Maiden, N.C., will be powered entirely by renewable energy by the end of 2012. The feat will be accomplished with the construction of two new solar array installations around the existing facility, as well as high-energy cells and an advanced solar tracking system. Greenpeace's initial "How Clean is Your Cloud?" report, issued in April, accused Apple of lagging behind other technology companies like Facebook and Google in utilizing environmentally friendly power for its cloud-based services. Apple, however, rejected the estimates in Greenpeace's study, and provided its own figures, which claimed that renewable energy would provide more than 50 percent of the center's power needs than was originally projected, even before Apple announced its plans to rely entirely on renewable energy at its Maiden facility. The updated report issued by Greenpeace on Thursday was Apple-specific, as no other technology companies saw their grades or key sustainability criteria changed. The organization said it plans to re-evaluate Microsoft and Amazon in light of any action or inaction in a subsequent report later this year.